My daughter is a teenager. When I say “Strong”, I don’t just mean physically. When I say “strong“, I mean mentally strong. And that strength would prove so useful, especially in this one situation with a boy. What Do I Consider a “Trump World”? 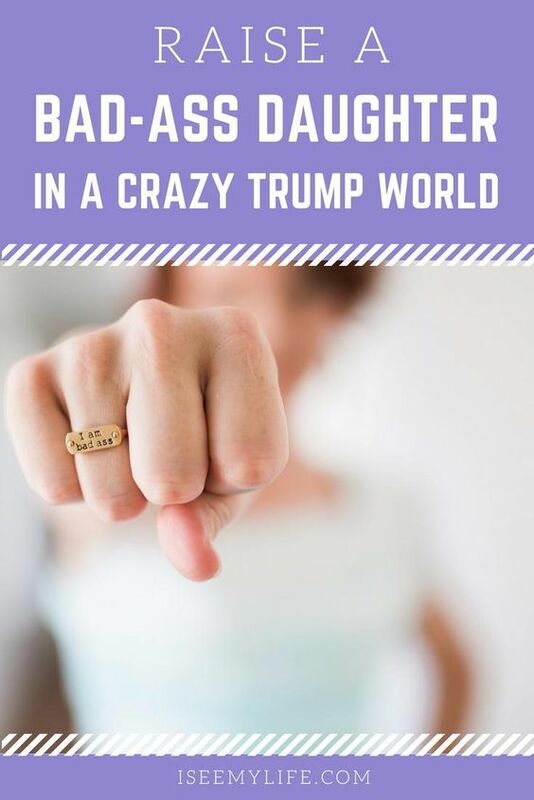 When I refer to a “Crazy Trump World”, I am referring to our society where men say vulgar things about women like Trump did on the Access Hollywood tape. So what happens when a high school boy says vulgar things about a girl? One particular incident occurred early in my daughter’s freshman year. She had been friends with a boy since middle school. They’d talk via social media frequently. My daughter hears from multiple reliable sources that this boy is talking about her. Talking about her in a sexual manner. And he’s not having these conversations in a locker room. No, he’s saying these things to girls who are also my daughter’s friends. You know how we bash on social media because people are extra brazen and use it and say things they wouldn’t say to your face. Well, it worked in my daughter’s favor in this situation. She contacted the kid via social media. Now, if social media wasn’t an option she would have had this conversation in person. However, using social media allowed her to process each of his responses and reply in a way she felt best reflected her feelings. In person, she may have just gone off in a fit of anger – screamed at the kid – and maybe her point wouldn’t have been as clear. In any case, she confronted him about the things he said. His response was a combination of accusations, downplaying and denial. Her response was to the point and clear. She made it clear that talking about her in that way was unacceptable. She had considered him a friend, but a friend wouldn’t say such vulgar things. There were a few other things said. Then she told him not to talk about her. And not to talk to her. She cut off all communication with this kid. The following school year, my daughter ended up having a class with this kid. She even had to do group work with him. So she decided, to talk to him. She explained that what he said was unacceptable. But that she was okay with talking so it would make classes easier. They were able to coexist in classes. She still doesn’t want to be good friends with this kid. Is Trump to Blame For This? I’m not blaming Trump for this interaction. I’m blaming lack of respect. I realize that in our society – men talking about women in a sexual manner is acceptable to some people. No, this did not start with Trump. This has probably been happening for years – decades – generations. But Trump is in a position now to set the example. Set the example for what is and isn’t acceptable. I know, it’s weird to say that about a politician, right? Disrespecting women is not acceptable to me. It isn’t acceptable to my husband. We raised our son to speak about women with respect. We raised our daughter to only accept respect. And maybe, in the end, that’s all we can do. Isn’t that is what all parents should do? We should raise our children, boys and girls, to speak about others with respect. We should raise our children, boys and girls, to demand respect. 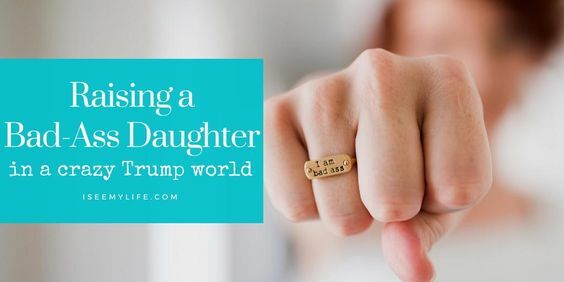 We should raise them to be strong enough to stand up – confront – and walk away from people who treat them any less than they deserve to be treated. How Do You Teach Your Children to Be Strong? This incident didn’t just unfold on its own. My daughter came home from school and talked to me about the situation. We discussed how it made her feel. And what she wanted to do. We didn’t just discuss her feelings. We actually came up with a plan. And it wasn’t a plan I devised. I asked her what she wanted to do. We fleshed out all the different possibilities. We discussed what his responses might be and how she would respond to those. Then, when she felt confident that she was ready to confront him – she did. I know that my daughter was hurt. She was hurt and embarrassed by what was said about her. But I also allowed her to get mad. I feel like “hurt” and “sad” aren’t very actionable feelings. But I don’t think a lot of action and improvement happen from a place of sadness. But a lot can happen when we get angry. When we have that fire. I let my daughter feel hurt. I let her own that. But I also let her get angry. And from that anger, she was able to act. But a plan of action – that makes a difference. With my daughter, we discussed her options. She could say nothing – and just deal with it and move on. She could say something – discuss with him know how it made her feel. She could say something – and also hold him accountable – include some sort of actionable response to what he said. She chose the last option. Mostly because she was so mad and disgusted with the things he said that she didn’t want to be his friend. She didn’t want to be nice to him. She didn’t even want to be around him. I am thrilled that I’ve raised a child who will stand up, say something and take action when she is wronged. She doesn’t need other people to do it for her. She knows she is strong enough to advocate for herself. As parents, we need to make sure that we are raising children who are strong. Because that strength will serve them well, regardless of who the President is!